If you read the left-leaning and much of the mainstream press it's easy to believe the Prime Minister Binyamin Netanyahu is the problem, or at least a big part of the problem, in the stalemated talks between Israel and the Palestinians. He is often described as "right wing" and "hard line" when nothing could be further from the truth. Part of the reason, of course, is that he is from the Likud party. Likud is seen as the Israeli equivalent of the Republican Party by many American liberals. That is an oversimplification and is really incorrect. The Prime Minister himself corrects journalists, steadfastly referring to Likud as center-right. Israel is a multi-party system and, much unlike the Republicans, those right of center divide into a number of secular and religious parties. 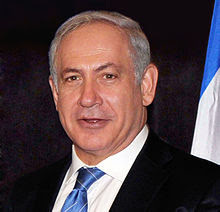 Prime Minister Netanyahu has committed himself to "two states for two peoples" and he is the elected leader of Likud. That position is an anathema to the truly right-wing parties, for example, National Union, which is in opposition to the current government. This Prime Minister lost his government during his previous term when the right wing parties pulled out of the ruling coalition, including breakaway members of Likud. It wasn't the left that brought him down; it was the right. Why? He signed the Wye River Memorandum and gave control of more land to the Palestinian Authority, including most of Hebron. I have no doubt that Prime Minister Netanyahu would do the same again if there was a real chance for peace. Right now there isn't one. The problem is, and always has been, the Palestinian leadership. They have had a total of three leaders since 1919: Haj Amin al-Husseini, who sided with the Nazis in World War II and wanted to bring Hitler's final solution to Palestine, his nephew and chosen successor, Yassir Arafat, and Arafat's hand-picked successor, Mahmoud Abbas, whose doctoral dissertation amounted to Holocaust denial. Yes, people can overcome their past. Anwar Sadat flew planes for the Nazis and led Egypt to war on Yom Kippur in 1973. Today we remember Sadat as a man who gave his life for the sake of peace. Sadly, Abbas is no Sadat. He insists on terms that he knows Israel can never meet as preconditions to negotiation, guaranteeing their failure in advance. Look what Prime Minister Ehud Olmert offered the Palestinians in 2008: land equal in area to what Jordan and Egypt occupied prior to 1967 with land swaps to account for present demographics, a divided Jerusalem with holy sites under international control, and a symbolic, limited acceptance of some Palestinian "refugees" into Israel. It's the most Israel probably could ever offer. The Palestinians didn't even respond and offered no counter-proposal. What on earth could Prime Minister Netanyahu offer that hasn't already been offered? How is Prime Minister Netanyahu an obstacle to peace when he repeatedly says he will negotiate at any time in any place the Palestinians may choose? He's made the same offer to Syria. The answer is simple: Prime Minister Netanyahu is not a problem except in the minds of those who always find reason to blame Israel and those who believe them. The Center for American Progress (CAP), a prominent Washington think tank, are the folks behind the Think Progress website. Their views are both influential in and often representative of the Progressive (liberal) wing of the Democratic Party. They have always had anti-Israel writers. That's nothing new. However, their writing has recently descended into anti-Zionism and anti-Semitism of the ugliest kind. Normally this is the sort of thing I would write off as far left and move on. What makes CAP different is that the group routinely advises the Obama administration on Middle East policy. The statements in question are blog posts and Twitter tweets referring to American supporters of Israel as "Israel firsters", a term which originated and until recently resided exclusively in the neo-Nazi fringe. It's the old charge of dual loyalty or disloyalty to America leveled at American Jews since the 1920s. The term was used by Think Progress blogger Zaid Jilani according to pieces in The Washington Post, The New York Post and The Jerusalem Post. Other Think Progress writers have made statements that are equally offensive. Despite this clear statement Progressives are still claiming that the whole issue is an attempt to smear CAP. One example, written by Glenn Greenwald at Salon.com blames everything on "the predictable roster of neoconservative, hatemongering extremists..." while expounding on his own anti-Israel positions that are every bit as biased, misinformed and even repeat the popular and libelous "apartheid" charge against the Jewish state. These aren't right wing groups, nor are they neocons. These are some of the most respected and influential Jewish groups in the country. Perhaps the folks associated with CAP and their defenders, instead of lashing out at their critics, should remember the words of Dr. Martin Luther King, whose work we commemorated just a week ago, "When people criticize Zionists, they mean Jews. You are talking anti-Semitism." Indeed, and many if not most American supporters of Israel, both Jewish and Christian, identify themselves as Zionists. What makes this issue so very critical is the fact that this is the organization that advises President Obama on the Middle East. I am now genuinely worried the Obama administration's schizophrenic policy towards Israel would turn to open hostility in a second term. I remember how President Bush was supposed to be the "best friend" Israel had in the White House and how that friendship evaporated in his second term. Those who read this blog between 2004 and 2008 will remember just how critical I was of the Bush administration. During the 2008 campaign I blogged about my concerns about President Obama's then foreign policy advisers. While I had endorsed John Kerry in this blog back in 2004 I could not, in good conscience, do the same for then Senator Obama. In the end Mr. Obama distanced himself from the ones that were most troubling to Jewish and Christian supporters of Israel. The President captured 78% of the Jewish vote as a result. I freely admit I voted for President Obama, mainly due to economic issues, but I had been sufficiently reassured that the new administration would not be hostile to Israel. In order to repeat the 2008 results the President will have to repeat his actions from that campaign: distance himself from the fiercely anti-Israel and sometimes even anti-Semitic crowd at CAP. If he can't do that then I can and will vote Republican for President for the first time since 1988. There's an old proverb that dates back to at least the 16th century that is apropos here: "He that lies with the dogs, riseth with fleas." If the President chooses to keep the folks from CAP as foreign policy advisers and if CAP, in turn, keeps these writers on board I have a real problem. How can I trust that the President doesn't share some of their views or won't come to adopt some of their anti-Israel policies? I am deeply worried about what the President is thinking about Iran, about Israel, about the Palestinians and about foreign policy in general and how things might change in 2013 if he is reelected. I wish I could have President Obama's social and economic policies and Speaker Newt Gingrich's foreign policy. I can't have both so I have to choose. So... I am definitely undecided at this point. The Republicans and the right have been trying and failing to make Israel a right/left wedge issue for years. Now the Progressives in the Democratic party have done it for them. Is this really the path you want to go down? When the Democratic Party is on the verge of losing someone who has voted straight Democratic Party line in every election since 1992 you know something is wrong. Mainstream Democrats had better think twice about the trend towards virulently anti-Israel positions in their Progressive wing. If the Democrats lose people like me at the time Republicans have shifted way to the right you know they are going to have problems winning elections. How is it "Liberal" to Advocate Genocide? Yesterday I once again found myself defending Israel and watching the opponents' arguments descend into defense of Iran and the desire they share with Iranian President Mahmoud Ahmadinejad to wipe Israel off the map. They would never admit they support genocide but that is precisely the only way the nearly 6 million Jews of Israel will be removed. These "liberals" are supporting a new Holocaust.